If you’ve traveled to our beautiful beach with your beautiful family, there are loads of attractions to keep you busy, on and off the beach. So play in the sand. Build castles, bury each other, dive in the pool and make memories. Then, head out to explore. At this family fun park, play a round of mini golf before hitting the Gran Maze, approximately the size of a football field. You and the kids will have fun testing your skills as you navigate your way out – and treat yourself to a well-deserved ice cream. Get up close and personal with your favorite sea creatures, from sea lions to dolphins, birds and more. Don’t miss the shows. You can also book an opportunity to swim with the dolphins. 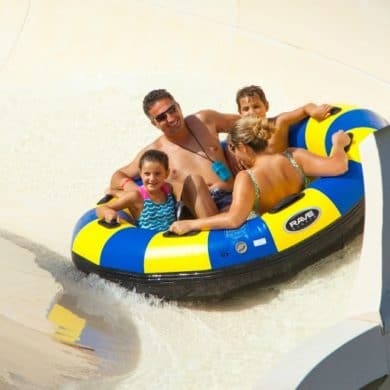 This wonderful water park features fun for all ages, from the Tadpole Hole to the Lazy River, Raging Rapids and Pirates Plunge. The Treetop Drop heads south from a 65-foot platform on your choice of an open-air or tube slide. Shipwreck Island is open June to Labor Day. On rainy days, to escape the heat, or just out of plain curiosity, head to this indoor museum filled with oddities from around the world, like shrunken heads and an authentic vampire-killing kit. There’s also a moving theatre, laser race and mirror maze! If you love being outdoors together, opportunities to explore our beautiful ecosystem abound at this state park, where you can hike, bike, kayak, picnic, birdwatch, swim or take a tour to Shell Island.